If you learned to drive before the Internet, like I did, you probably spent a lot of time with the DMV Handbook learning the rules of the road. I’m sure I spent just as much time with John Brierley’s Guidebook, “A Pilgrim’s Guide to the Camino de Santiago” as I prepared to walk the Camino. And then I studied it everyday I was on the Camino. My copy is dog-eared and water-stained. But I love it. 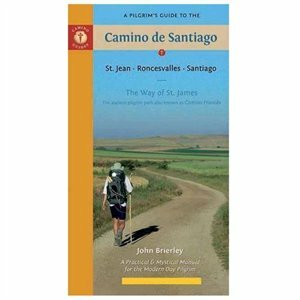 Unlike a lot of guidebooks, this one has a definite voice, of John Brierley, who’s very male, Anglo, fit, and for some reason, doesn’t much like pilgrims to spend time in cities along the Camino. After all the time I’ve spent with his book, I feel like I know the guy. Those are very big questions for a travel guidebook. But the Camino is a very big walk. Brierley keeps reminding you that you’re on a Pilgrimage. Even on the days when you wonder why the heck you are walking for in the rain for five hours. Brierley balances these big, philosophical questions with a ton of practical details. He breaks the Camino into thirty-three stages. Each stage is meticulously researched and has its own map and contour guide so you can see what kind of elevation to expect from day to day. The listings of amenities, down to individual villages, are very accurate. Access to this kind of information in English was priceless to a tired Pilgrim. He also includes “Personal reflections” from Anonymous Pilgrims. When I read them before walking the Camino they seemed sentimental or even surreal. But once I was a Pilgrim myself, they made much more sense, and now they remind me of what it’s like to be in the Pilgrim state of mind. You’re often bone-tired, sore, and nursing an injury. You’re also full of joy, endorphins, and having the time of your life, all at the same time. Being a Pilgrim means entering an altered state of wonder. In that altered state it’s easy to forget your physical limitations. Even though Brierley recommends taking it easy in the first few stages, and listening to your body, the fact that he’s chopped the Camino into 33 stages makes it seem like everyone should be able to walk 20-30 kilometers every day. His stages have become normative for American Pilgrims. Beware! In your “regular life” you would never walk a half-marathon a day thirty days in a row. Even after training for the Camino, most people need more than the 2 rest days he recommends. It’s easy to overdo it, injure yourself, and have to stop, or even go home. That’s what happened to me in June, 2013. When I returned in October of the same year, I cut Brierley’s stages in half—to 12-15 kilometers a day. It opened up the Camino for me because I was no longer focusing on getting to a certain town at the end of each Brierley stage. I stopped whenever I wanted to. The journey became more about the journey than the destination. And that is what the Camino is all about. As time went on, I found myself leaving my Brierley guide in its ziplock bag, and just enjoying where I was on the Camino. That’s what the Camino is about, too. The maps began to seem unnecessary. 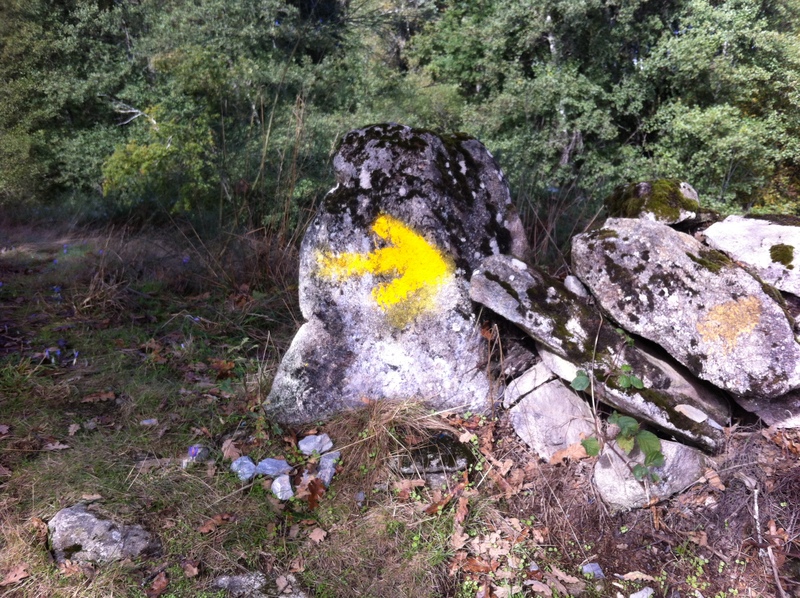 The yellow arrows marking the Camino were enough. Perhaps the best thing about the Brierley guide was that it helped me to have more faith in myself as a solo traveler, and to claim my own Camino. But life is more unpredictable than that. We sometimes find ourselves on the most difficult path that we would have never chosen. Or have long phases of sameness, like the section on the Camino called the Meseta. Who’s with you on the journey makes all the difference. Even at his most mystical, John Brierley never mentioned this: Jesus kept showing up to walk with me, through my fellow Pilgrims. Dear Pilgrim, I hope you enjoy Brierley’s guidebook as much as I have. It points you toward the good stuff. But remember to take your eyes off the guidebook and live in the moment. It’s even better than what Brierley describes.